"Eight of us stayed at Villa Toga with an age range of four to 70. We loved every minute. The villa is spacious… The pool was fantastic…"
"Fred, our Simpson Travel representative, was excellent and went out of his way to make our stay comfortable and enjoyable. The apartment at Alto di Pinarello was spacious and the pool immaculate. Thank you for a great week." "Villa Barbarossa is a great place and in a very quiet location so it’s ideal for a total wind down, swim and opportunity to read and soak up the sunshine. 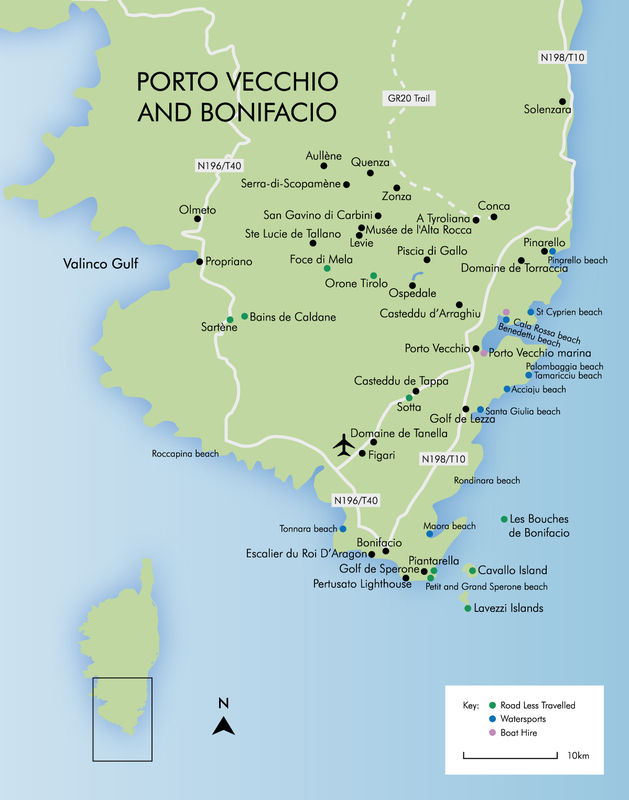 Bonifacio is only half an hour away with its marina, citadel and old town. Good food and plenty of atmosphere." "Apart from just always having a brilliant experience through Simpson Travel, I have to say that Suzie and Jacques’ A Sulana makes for a perfect holiday destination for us..."
"We thoroughly recommend Simpson Travel. Friendly and knowledgeable staff both when booking and when in Corsica. Alzitella has the most amazing views and is very well equipped and located. Thank you Simpson Travel!" The magnificent stretch of coastline between Bonifacio on Corsica’s southern tip and Porto Vecchio, 30 minutes up the eastern coast road, has become a draw for Europe’s more discreet high society – and it’s easy to see why. Pristine white sandy beaches are the places to be seen sipping a cocktail, while Michelin-starred restaurants and chic bars beckon ashore the occupants of yachts lining Porto Vecchio’s picturesque old harbour. The streets below Bonifacio’s well-preserved fortifications, where you’ll find the town’s ancient citadel, are lined with stylish independent boutiques and sophisticated cocktail bars promising a well-deserved apéritif on your descent. Away from the glamorous harbours and beaches, you don’t need to go far to discover a quieter side to Corsica. If you know where to look, there are hidden beaches that remain virtually deserted even in the height of summer. Inland, the sheer scale of the dramatic Alta Rocca region means you can quickly lose yourself in a far more traditional Corsican experience, less than an hour’s drive from the coast. Porto Vecchio sits at the end of the GR20, Europe’s toughest long-distance hiking route. But the town offers plenty of leisurely strolls, along with the gentler arts of shopping and wine tasting. Founded in 833 by Boniface, the Count of Tuscany, Bonifacio wears its historic connections proudly. The harbour is said to be the one described in Homer’s Odyssey, its citadel built by the Genoese, and the road leading to it, home to number 7 Rue des Empereurs, the onetime abode of Corsica’s most famous son, Napoléon Bonaparte. From the harbour, a short boat trip provides a wonderful way of viewing the ancient garrison. From sea level, you suddenly realise that the town is literally clinging onto the cliffs; the giddying drop to water level explaining why Bonifacio has never been breached! Around the scenic Gulf of Porto Vecchio, at child-friendly beaches such as Palombaggia (voted among the best in Europe), the gently shelving, soft, pine-shaded sand makes holidays in this region a firm favourite with families. Inject some adventure into your days at the seaside with a popular boat trip, either piloted or private hires, to the secluded islands off the main coast. Along the way, you’ll discover wonderful places to swim and snorkel, as well as deserted beaches only accessible by sea. Corsica is the most mountainous island in the Mediterranean and, with over a third of the land dedicated to nature reserves, our visitors to Porto Vecchio and Bonifacio invariably appreciate how little development there has been – and how seamlessly buildings complement the environment. Adventurous types can spend their days scrambling along canyons, navigating dizzying bridges and hiking long distances, while those who want to appreciate nature at a slower pace can stroll around waterfalls, cool off in mountain springs or take long, leisurely drives through scenic villages. Corsican cuisine is defined by the maquis, the dense shrubland covering the island’s rugged interior, providing rich pastures for snuffling wild boar and wild pickings to fill the larder. The fruit of the chestnut trees are simmered in stews and made into unctuous sweet spreads and preserves. The smoky nutty flavour of chestnut flour enhances everything from bread to beer, as does the distinctively Corsican version of polenta still on the menu in traditional auberge restaurants, where meals are rustic and hearty, a unique blend of French and Italian influences. There are weekly food markets in most towns and smaller local supermarkets often have aisles dedicated to homemade produce. Look for the symbol of indigenous cuisine, a Moor’s head wearing a blindfold as a bandana. Join Corsican café society and dunk sugar-coated canistrelli biscuits in a café noisette – espresso topped with an equal quantity of steamed milk. As you would expect, pastis is the universal apéritif; but be sure to try myrte: eau de vie macerated with sugar and myrtle berries foraged from the maquis. Porto Vecchio’s beautiful Old Town walls are where you’ll find some of its finest restaurants, with views across the fashionable marina. There’s also a great choice of cuisine lining the main square. In Bonifacio, fresh mussels are the most popular dish of the day in the harbour eateries, along with a wide selection of seafood and aubergines à la Bonifacienne, a local speciality. If you’re in no hurry, explore the town’s narrow streets and you’ll find plenty more, less frequented dining options. Kick back with the international jet set, who come to be seen and indulge in fine dining along this long stretch of sand, shaded by pines and with sunbeds to hire. After a 20-minute drive from Porto Vecchio, follow the signs to Hôtel Palombaggia. There’s parking at the end of this road. The beach and its many popular restaurants draw the crowds in summer, but there’s usually plenty of room for everyone with the sands continuing onto Tamaricciu beach, just across the lagoon. This beach oozes St Tropez glamour. Join the jet set on the wooden decks overlooking the surf and sample the grilled fish from the chic waterfront restaurants. Just along from Palombaggia, these sands, with roadside parking, are an easy-to-reach 20-minute drive along the coastal road from Porto Vecchio. These sands, like those of neighbouring Palombaggia, can get crowded, so it’s worth arriving early to reserve your spot. They’re popular for watersports and snorkelling and equipment can be hired here. Either side of the picturesque Cap D’Acciaju lie two south-facing beaches, the most southerly of which is semi nudist. There are beach bars and also sunbeds and parasols for hire. Acciaju’s pay car parks are found a little further along the Palombaggia road from the beach of the same name. The Cap’s many rocky outcrops and translucent waters are lovely for snorkelling. There are also some watersports available at various points along the powdery white sands. A popular beach with young families due to its shallow waters, beautiful white sand and plentiful facilities, including watersports, beach bars and restaurants. After a 30-minute drive from Porto Vecchio you’ll find plenty of signs to the beach along the peninsula road. Parking here is limited. There are restaurants on the narrow bay that rent out loungers and parasols in high season and are perfect for a long, lingering lunch. Several chic beach bars and small boutiques lie on the white sands, with more restaurants, shops, a dive school and watersport facilities tucked behind the rocks of this crescent-shaped bay. Take a 25-minute drive north of Porto Vecchio towards St Cyprien. A free car park lies 400m from the beach. Plenty of natural shade from the pine trees, fine sands and shallow waters make this ideal for young children. Sunbeds and parasols can be rented from the on-sand restaurants. A secret gem of a bay, with plenty of watersports to entertain, a selection of good restaurants (some more formal) for dining and lovely shady spots for a post-lunch siesta. 35 minutes north of Porto Vecchio, park for free near the southern beachside restaurants or along the coast road under the pines. Located on the side of a shady pine forest and with lovely shallow water, this is great for families – and the waterfront restaurants here are perfect for a classy evening meal. Due to limited parking, this isn’t a hugely popular daytime destination, but it’s a lovely place for an evening swim, followed by an apéritif in the hotel there. Take the N198/T10 from Porto Vecchio towards Bastia, following signposts for Cala Rossa. Further along you’ll find the tiny beach of Benedettu. At the hotel end, the water is relatively shallow; elsewhere the sea becomes deeper very quickly so isn’t ideal for non-swimmers. Both beaches have watersports and sailing. As the name suggests, this is a gorgeous circular bay with fine white sand. Don’t be surprised to find a few cows lazing around the beach restaurant! A pay car park lies at the end of a winding road off the turning to Suartone, 45 minutes south from Porto Vecchio. Sunbeds and parasols are available to hire from the restaurant. More active types will enjoy the walk all the way around the horseshoe’s turquoise shore. This sandy beach with rocky outlets can be quite wild and windy, making it ideal for jet skiing and kite surfing. You can also hire quad bikes during the summer. On the N196/T40 north from Bonifacio. The beach is signposted to the left, adjacent to a large, free car park. Once the daytime crowds have departed, the two waterside restaurants, backed by maquis, are a lovely place to have a quiet evening drink and get away from it all. Set sail for a day of snorkelling in the crystalline waters of remote sandy coves. Piloted boats are available at a premium and are available from Porto Vecchio Port, but small boats don’t require a licence and can be hired at Benedettu beach. The windy west coast is a mecca for kite and windsurfing. Ask your representative for details of schools and rental possibilities. For a great way to explore the dramatic Corsican coastline at a gentler pace, hire a sea kayak for one or two people. If your travel insurance covers you, spend a wet and thrilling day canyoning in the mountains, jumping in rock pools and sliding along smooth canyons. For more information, visit the tourist office. Please note this is only suitable for children aged over seven. The protected Lavezzi Islands are one of the Mediterranean’s best dive spots, home to octopus, grouper fish and many more colourful marine species. You’ll find diving schools offering excursions for various levels of experience in Porto Vecchio and at St Cyprien beach. Corsican wine is enjoying something of a moment. Discover and purchase fine vintages and modern blends at the Domaines of Torracia and Fiori near Lecci on the road north. The soaring peaks and cavernous valleys of inland Corsica are replete with charming villages reminiscent of a bygone era. Quenza, Aullène, Serra-di-Scopamène, Levie, Zonza, San Gavino di Carbini and Ste Lucie de Tallano are all worth a stop. A round of golf doesn’t come much more scenic than one played at the Golf de Lezza in Porto Vecchio or the award-winning Golf de Sperone in Bonifacio, one of France’s premier courses. Pre-booking is essential to avoid disappointment. Get a whole new perspective on the Île de Beauté with a scenic helicopter flight from Porto Vecchio. Choose from coastal or mountain circuits or combine the two. This is a wonderfully memorable way to celebrate a special occasion. The island’s west coast offers a magical, kaleidoscopic sunset. Make your way to Tonnara, a somewhat remote but easily accessible beach. Take your own picnic or dine at a chic waterside restaurant specialising in seafood. Labour Day. Banks, post offices and other government buildings close, as well as most shops. Fête de la Victoire/Victory in Europe Day. Public holiday. Tour de Corse. The 700km cycle race passes through Bonifacio, Solenzara, Corte, Bastia, St Florent and Calvi before returning to Ajaccio. Fête de la Musique. Amateur and professional musical events throughout Corsica. Festival of Jean Baptiste, Patron Saint of Porto Vecchio. Evening procession with locals leaping over a bonfire in the Old Town citadel. Bastille Day. Public holiday. Fireworks in Bonifacio (13th) and Porto Vecchio (14th). Park out of town and walk in to watch from the port. A Festa Di Ghe Di Scè, cultural evening in front of the Eglise Saint Dominique, Bonifacio. Pinarello Jazz Festival, last Sunday in August to first Sunday of September. Major open-air music festival in Porto Vecchio. Bonifacio Argentinian Tango Festival. Dances, film screenings, exhibitions, concerts. Set your alarm for an early morning equestrian expedition along Palombaggia’s sands, arguably one of the island’s most famous attractions and winner of multiple ‘best beach’ polls. Enjoy the magnificent sight of the sun rising over the Tyrrhenian Sea while working up an appetite for breakfast at one of the many chic waterfront restaurants as the crowds arrive for a day of sunning and swimming. Sail from Bonifacio to the Lavezzi Islands and the natural reserve of Les Bouches de Bonifacio to explore deserted beaches, fantastic for snorkelling. On your return to port, open a bottle of wine and enjoy the sight of the setting sun casting an orange glow over the citadel, arriving at the buzzing marina just in time to take an evening apéritif. You’re unlikely to see many other cars on this little-known trail over the mountains from Sotta to Orone Tirolo and Foce di Mela. Along the way, you’ll discover numerous places to stop off and enjoy breathtaking views of the unspoilt countryside. Follow the road until the end and you’ll arrive at the Bains de Caldane, near Sartène, where you can relax in the soothing thermal baths. Drive to Piantarella along the white cliffs just outside Bonifacio, park and walk along the pristine beaches of Petit and Grand Sperone, where you’ll be rewarded with fine white sand, some of the clearest turquoise waters on the island to cool off in and sumptuous views of Cavallo Island and Sardinia’s La Maddalena. Take the road from Porto Vecchio to Ospedale and onto the reservoir, then carry on to Piscia di Gallo. Park up and take a leisurely stroll along the river, cooling off any time you like in one of the numerous deep rock pools situated under overhead springs. At the end of the walk, you’ll be rewarded with the sight of the island’s highest waterfall.